I've met some really lovely people during my travels. At the top of my list are Richard and Tommy, two friendly Americans I first encountered in India in 2001. I've since been back several times to see them. Richard is a professional photographer who creates beautiful sepia toned images. The ones of India, generally devoid of any contemporary reference, look as if they were taken in the last century. I seriously recommend you have a look at his website to see what I mean. In 2005 I was surprised and honoured when he asked me to write a short piece to accompany one of the photos for his new book, entitled "India Poems: The Photographs". In Delhi I was told that Dharamsala had been completely ruined by tourism. The speaker added, condescendingly, "You should have been there twenty years ago, when I was there ..."
I went anyway. He was wrong. A former British hill station, Dharamsala is now home to the Tibetan Government-in-Exile. It is also firmly established on the "backpacker circuit", full of Westerners who are "trying to find themselves", or just making a side-trip on their way to Nepal. Numerous guest houses and restaurants offer every conceivable cuisine ... along with the nightly pirated DVD played on predictably fuzzy televisions. But tear yourself away from the latest Hollywood releases and the ubiquitous banana pancakes, and you will discover a thriving, friendly Tibetan community. A stroll along the narrow lanes will cause you to haggle good-naturedly with the genial but ruthless Tibetan market women. You can explore the Buddhist monasteries and watch monks clap their hands and stamp their feet as they debate finer points of theology. You can talk to kind, curious Tibetans and no doubt help them to practise their English as you learn a few Tibetan phrases. Later you will enjoy momos and thukpa in tiny local restaurants, where Tibetans gather to warm their hands and feet as they discuss the fate of their invaded country and its revered Dalai Lama. There is an incredibly moving Tibetan Museum where you will find out what really happened to this people's country ... things which most Westerners know nothing about, and to which the Western governments have quietly turned a blind eye. Then get out of the village and wander along some of the picturesque trails nestled beneath the snow-capped Himalaya. There, if you're lucky, you will meet a wandering monk. 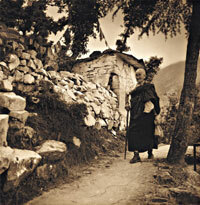 For me, this Waswo photograph is Dharamsala.